Koh Phangan is the largest of Samui's neighbouring islands with an area of 168 square km. The island has numerous heavenly white sandy beaches and secluded bays all along its coastline, some of them reachable only by a boat cruise. Over 3/4 of the island is mountainous tropical forest and a large part of it is classified as "national park" by Thailand. This preservation allows the island to keep its natural and untamed character, since the wonderful landscapes cannot be spoiled by excess buildings. We believe that the best way to discover Koh Phangan’s lush natural scenery, white sandy beaches and secluded bays, is by a sailing cruise aboard a junk boat. 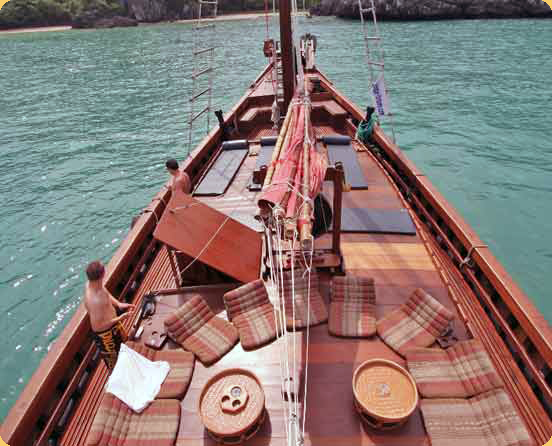 The boat we use is a beautiful sail boat built entirely out of teak wood. The boat is a traditional Burmese junk, 25 meters long and 7 meters wide, equipped with modern navigation and communication devices, as well as medical first aid equipment. The main sun deck is 44m² and provides plenty of room for sunbathing and relaxing, as well as unobstructed views of the Gulf of Thailand. There are three air-conditioned cabins with en suite bathrooms and hot water. You are welcome to use the cabins at any time. Your journey will begin at Big Buddha pier at Koh Samui where we will board the boat. After an hour and 15 minutes of peaceful Koh Phangan and Samui sailing, you will arrive at Koh Ma Island. A nice lunch will be served while you enjoy the views of Koh Phangan. We offer 4 different types of popular Thai dishes: Massaman chicken curry, green curry with pork, fish in garlic and pepper sauce, and sweet and sour shrimp. There will also be a selection of desserts and fruits. Koh Ma has the best Koh Phangan snorkelling and you will be able to jump in the water and enjoy the amazing soft coral and multicolour fish in the warm water. Our professional guide will assist first-time snorkelers, and will point out the best places to spot marine life. The underwater life is not as abundant as at Koh Tao, but some species, such as the beautiful Lion fish, can be easily spotted when snorkelling at Koh Phangan although it is rare on Koh Tao. For those who would like to try their luck fishing, we offer new fishing rods. After your Koh Phangan’S snorkelling experience at Koh Ma, the junk boat will anchor at Thong Nai Pan Bay on Koh Phangan´s east coast. You´ll be transferred to a small boat in order to explore the sandy, scenic double bays of Thong Nai Pan Noi and Thong Nai Pan Yai. Both beaches are the image of paradise, with softly curved white sandy bays surrounded by mountains covered in rich tropical rainforest. If you are for some water sports sea kayaks, water ski, and Jet Ski will be offer by a reliable operator at additional fee. After enjoying the double bays, we will leave Koh Phangan and head back to Koh Samui. On the way back, you can enjoy a refreshing hot shower and then have coffee or tea on the deck. High Tea includes a wide selection of tea, pastries and fresh fruit as well as great views of Koh Phangan's Haad Rin beach, famous for its full moon party that takes place each full moon. Tour includes: Hotel transfer, soft drinks, coffee or tea, buffet lunch, dessert and fruits, snorkelling gear including fins, fishing equipment, towels, safety equipment and insurance. 10:00 – 10:45 Transfer from your hotel to the pier. 11:00 The Junk boat departure Koh Samui, sailing towards Koh Phangan. 12:30 Lunch is served on route. 13:15 Arrive at Koh Ma, for snorkelling at best site of Koh Phangan. 14:30 Sailing around the magnificent scenery of Koh Phangan toads Thong Nai Pan. 15:30 Arriving at Thong Nai Pan Bays and transfer by small boat to the beach. 18:00 Enjoy spectacular Samui west cost spectacular sunset. Appetizers, dessert and fresh fruits are served on deck. 19:00 Arrive at Samui and Transfer back to your hotel.